Habit: Perennial herb, shrub, tree, fibrous succulent or not, from bulbs or rhizomes. Stem: above ground or not, branched or not. Leaf: simple, deciduous or not, basal or in terminal rosettes, generally sessile, linear, lanceolate, oblanceolate or ovate, fibrous or not, thin and flexible or thick and rigid or succulent; margin entire, fine-serrate, dentate, or with filaments, tips rigid or flexible, with a spine or not. Flower: bisexual; perianth parts 6, in 2 petal-like whorls, free or +- fused; stamens 6, +- fused to perianth, filaments often wide, succulent; ovary superior or inferior, chambers 3, style 1 (thick, poorly defined), stigma head-like or 3-lobed. Fruit: capsule, indehiscent, loculicidal, or septicidal. Seed: few to many, +- flat or ovoid, generally black. Genera In Family: 23 genera, 637 species: worldwide. Habit: Shrub- or tree-like, generally branched from woody caudex, occasionally dying after fruiting. Leaf: rosette basal or at branch tips, 2--15 dm, linear, thick, +- rigid, stout-spine-tipped, bases +- expanded, margins generally curved up, entire or dentate, often fibrous-shredding. Inflorescence: panicle [raceme], erect (pendent), dense; peduncle generally < 2 cm wide; bracts generally ascending. Flower: generally pendent, 3--13 cm; perianth parts 6 in 2 whorls, generally +- fused, +- white, fleshy, waxy; stamens 6, filaments +- thick, fleshy; ovary superior, 3(6)-chambered, generally green, style short, often thick, poorly defined, stigmas 3-lobed, white to pale green. Fruit: berry-like or generally capsule, erect or pendent, tardily septicidal or generally indehiscent. Seed: +- many in 2 rows per chamber, often flat, black. Species In Genus: +- 40 species: eastern coastal plain, southeastern, sc, & especially dry southwestern North America; northern, central-western Mexico, northern Central America. Etymology: (Haitian: yuca or manihot, because young inflorescences occasionally roasted for food) Note: Pollinated at night by small moths while laying eggs in ovary. Yucca whipplei moved to Hesperoyucca. Habit: Plant 1--15 m. Stem: erect, above ground, generally branched above, rosettes at tips, well above ground. Leaf: 15--35 cm, 0.7--1.5 cm wide, dark green, expanded base 2--4 cm, 4--5 cm wide, +- white, margins minute-serrate, yellow. Inflorescence: 3--5 dm, distal generally +- 1/2 exserted from rosettes. Flower: erect; perianth 4--7 cm, +- bell-shaped, parts lanceolate to oblong, +- fused at base, cream to +- green; filaments thick; pistil +- 3.5 cm. Fruit: capsule, spreading to erect in age, 6--8.5 cm, ellipsoid, dry, spongy, or leathery in youth. Ecology: Desert flats, slopes; Elevation: 400--2000 m. Bioregional Distribution: s SNH (e slope), Teh, e SNE, DMoj; Distribution Outside California: to southwestern Utah, western Arizona, southern Nevada. Flowering Time: Apr--May Note: Growth form variable. Citation for this treatment: William J. Hess 2012, Yucca brevifolia, in Jepson Flora Project (eds.) 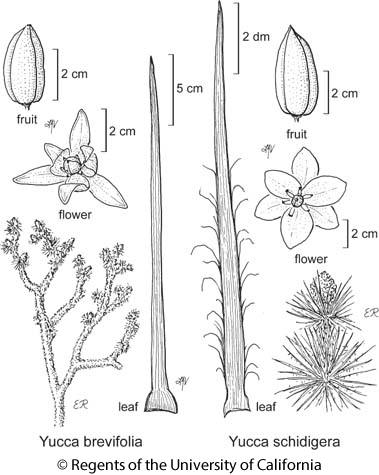 Jepson eFlora, http://ucjeps.berkeley.edu/eflora/eflora_display.php?tid=48766, accessed on April 19, 2019.
s SNH (e slope), Teh, e SNE, DMoj; Markers link to CCH specimen records. Yellow markers indicate records that may provide evidence for eFlora range revision or may have georeferencing or identification issues. Purple markers indicate specimens collected from a garden, greenhouse, or other non-wild location.